It’s fresh fruit season and I love finding new ways to serve fruit to my family! 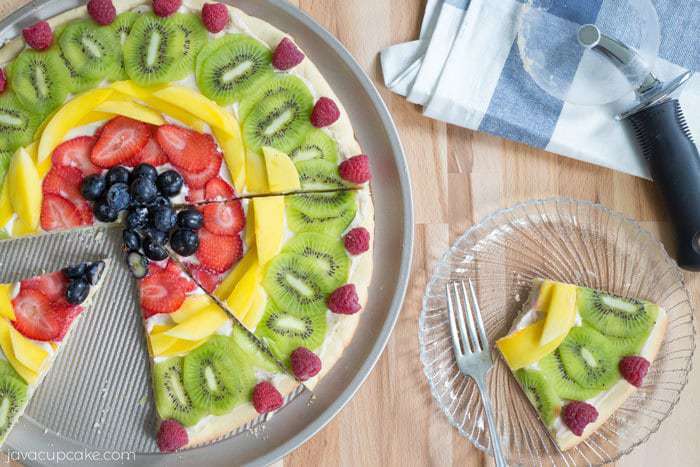 This Fresh Fruit Dessert Pizza is a fun, delicious way to get my kids to eat more! OXO provided the tools to make this dessert pizza, however all the opinions are my own. When OXO asked if I wanted to be a part of their pizza campaign, I was a little unsure if my baking blog would be a good fit. 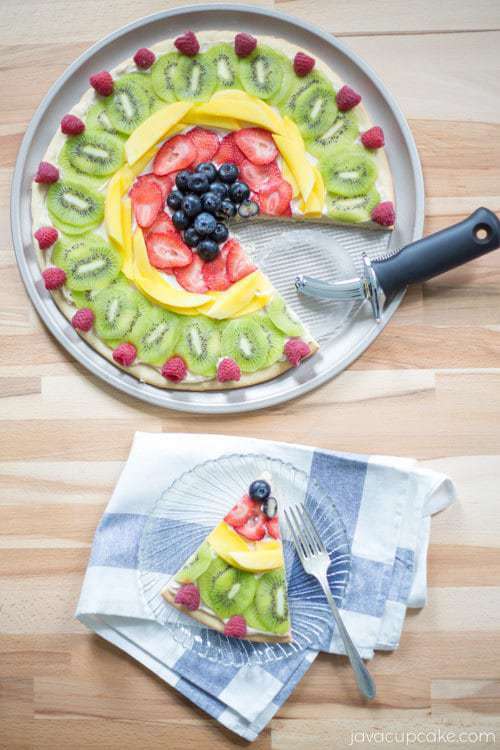 However, once I saw that the OXO Complete Grate & Slice Set was a part of the tools they were providing, I knew it would be perfect to slice fruit with and the idea for a Fresh Fruit Dessert Pizza was born! 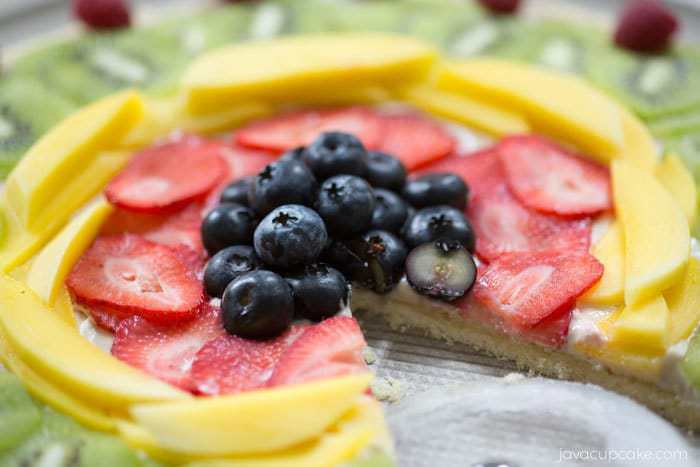 The Fresh Fruit Dessert Pizza begins on a sugar cookie crust. It’s topped with a sauce that is made of cream cheese, dark brown sugar and cinnamon (to die for!). 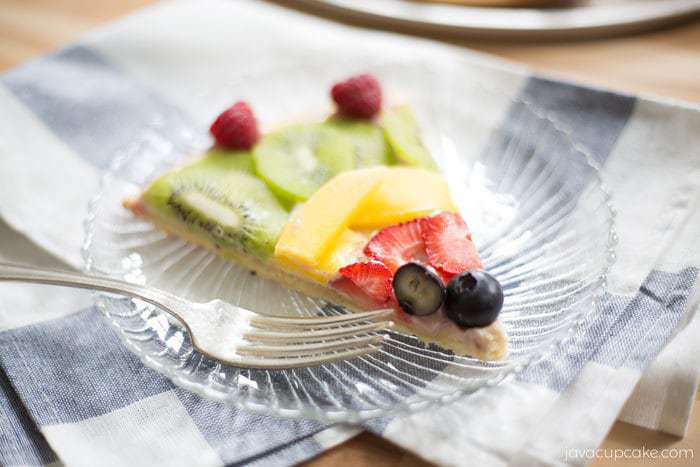 The fresh fruit could be anything, however I chose some of my favorites… kiwi, berries, and mango! The OXO Complete Grate & Slice Set includes coarse and medium grating and straight and julienne slicing surfaces. Each can be used over bowls or plates or placed on top of the lid, which doubles as a container for collecting and measuring. 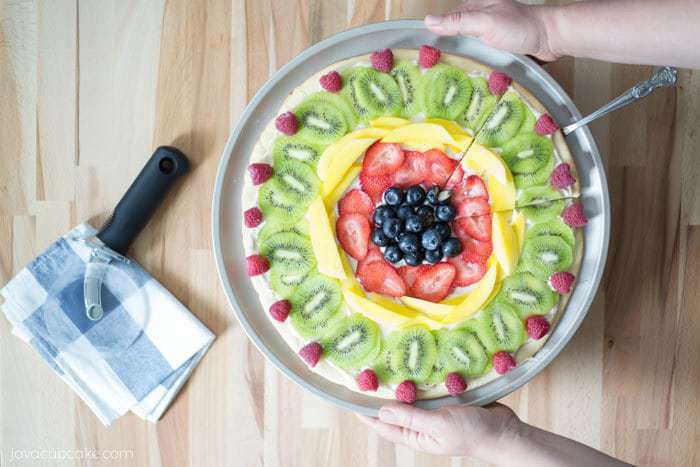 I used the thin sliced, red blade to cut the kiwi and strawberries for this dessert pizza. It cut perfectly thin and even slices! The pizza dough/crust was baked on the OXO Non-Stick Pro Pizza Pan. This pan features a micro-textured pattern to improve airflow for even baking and rigidity for strength and durability. I loved that the cookie didn’t stick at all to the pan and it actually made a perfect serving platter. I didn’t have to transfer the cookie off the pan to serve. It was perfect! The sauce, as I call it, for this dessert pizza isn’t your typical cream cheese mixture. It has added brown sugar and cinnamon to give a richer flavor. To be honest, I could probably eat the sauce just by itself with graham crackers or apples! It’s so yum! The OXO 4″ Pizza Wheel‘s clear plastic wheel won’t damage non-stick pans, and the slick surface prevents cheese from sticking. It’s actually big enough to help serve each slice. 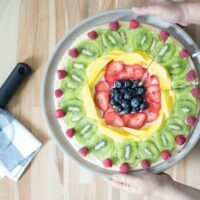 This Fresh Fruit Dessert Pizza is perfect for your next summer party or just as a treat for your family! In the bowl of your stand mixer, cream the butter until smooth. Scrape the sides of the bowl. Add the sugar and beat on high until incorporated. One at a time, add the eggs and beat well after each addition. Mix on high for 1 minute until pale yellow and fluffy. Add this mixture to the butter and sugar and mix until just combined. Cover with plastic and refrigerate 2 hours or over night. When ready to bake, preheat oven to 400 F degrees and line a cookie sheet with parchment paper. On a floured counter, knead the dough 2-3 times until smooth. Roll out dough in to a circle until it is the size of the OXO Non-Stick Pro Pizza Pan. Fold in half and gently transfer to the OXO Non-Stick Pro Pizza Pan. Poke the dough with a fork to create air holes. Bake for 6-8 minutes or until the edges just begin to brown. DO NOT OVER BAKE! In a bowl, combine the cream cheese, sugars, vanilla, and cinnamon. Beat together until incorporated and smooth. Scrape the sides of the bowl to ensure everything has been incorporated. Mix on medium-high for 30 seconds. Peel the kiwi. Clean the berries and dry. 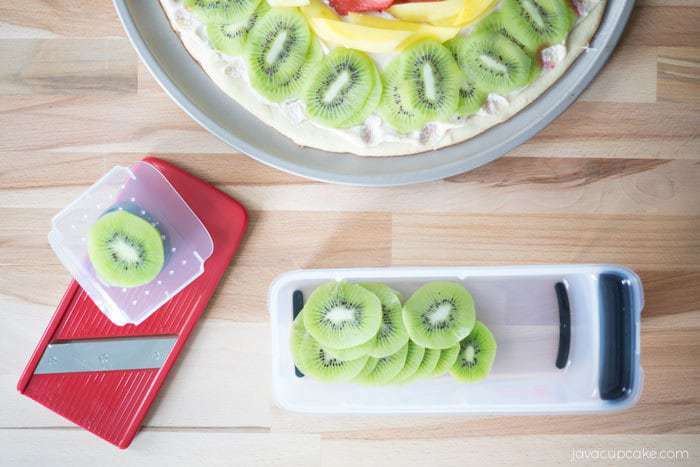 Using the OXO Complete Grate & Slice Set, cut the kiwi and strawberry into thin slices. Peel the mango and slice into long, thin pieces. Spread the sauce over the top of the cookie leaving about 1/4" of the crust exposed along the edge. Get creative!! Place the fruit on top in a decorative manner! Use the OXO 4" Pizza Wheel for Non-Stick Pans to cut into pieces and serve immediately. Your instructions mention shortening but its not in the ingredient list. ??? ?